Coral Springs started the game off quickly going up 12-3 in the first quarter forcing an early time out. After the timeout, Winter Park settled down and closed the half off with a 19 to 11 run cutting the lead to 23-22 at the half. All year long we have been playing on the edge. We went through a stretch where it seemed like every game we were playing was coming down to the last possession. The beginning of the third quarter started like the beginning of the game with Coral Springs going on a 11- 3 run to start the quarter. Led by three 3 pointers by junior forward Wyatt Wilkes to end the quarter, the Wildcats was able to tie the game up at 40 going into the 4th quarter. "I came up here my freshman year and I felt comfortable shooting here. The shots was not falling early but I felt like I found my rhythm and was able to hit my shots in the third quarter." Wilkes said. 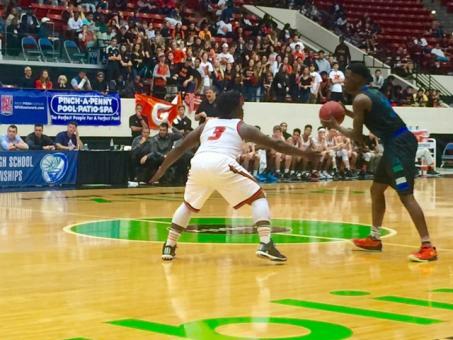 With the game tied at 48, Coral Springs took the lead on a shot by Chris Lucien after he rebounded the shot by Myron Dewar with 1:39 left to go in the game. Winter Park had some chances at the end but was not able to complete the comeback. Trailing by nine points early in the first quarter, Winter Park must have felt right at home in the 8A semi-final game against Coral Springs. All year Winter Park has played in games in which they seemingly had to play from behind to win.